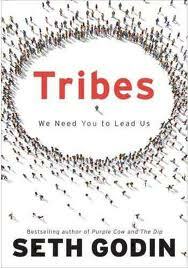 It was with some trepidation that I took at look at Seth Godin’s Tribes book. This was primarily due to mixed reports from friends whom had read it. It was so mixed that it was pretty evenly split down the middle 50% loved it, 50% hated it. Those that didn’t rate it felt that it was overly repetitive. My immediate thoughts – I LOVED IT! This is probably saying something seeming how cynical or pessimistic I can be about books, blogs, presentations, etc. Without a doubt I would recommend this to others for a read; it is nice and short, about 150 pages and half the size of a normal book. I wouldn’t say it’s insights are anything new for me, but there was a lot of strong re-affirmations to how I feel on a number of subjects. The biggest thing for me about this book was that I felt motivated as a result of it, although my passions are already quite strong, after this book they felt on fire. Heretics, innovators, revolutionists. Whatever you want to call them it is about not settling for mediocrity and instead striving forward towards an area that you are passionate about. Those that inspire others with their passion become leaders. Do something! Take control of your life and join or lead a tribe now. Sheepwalking is a beautiful term for those who are just following the pack and not asking questions. It’s almost as bad as sleepwalking through our working lives. Seth Godin’s movement is to make movements. Eat more prunes. After reading this book and talking to colleagues about it I remarked how I had always felt comfortable with the revolutionist tag but was now on my way being comfortable with the heretic tag. My colleague’s response – ‘You aren’t a heretic, you are a heresiarch.’ I would probably rank the likes of Alistair Cockburn, Jeff Sutherland, Martin Fowler, etc with that tag rather than myself as they started the revolution. For me, it is about evolving the revolution to the next phase. Some tribes are stuck. They embrace the status quo and drown out any tribe member who dares to question authority and the accepted order. Is Agile stuck? Are the heresiarch’s beyond reproach and questioning? Hmm we aren’t there yet – but everyone should be a leader of themselves. Do something you are passionate about! Leadership is about creating change that you believe in. Leaders have followers, managers have employees. Organisations don’t have to be factories, not anymore. Factories are easy to outsource. This is where our real value add is. As work gets continually outsourced we need to be innovative as thought leaders to continue to preserve our way of life. Don’t get me started on this one. I just want to re-affirm that I believe this strongly. Wow. I say this regularly and it always felt like no one understood this. Maybe Seth is a secret twin? It’s not just the curious, we are molded to do exactly as we are told by parents and teachers, to comply. Why is it so hard to say ‘no’ to your boss for that new piece of work when you are already 150% overloaded – it is because of many years of conditioning as a child to not say no to a perceived position of power? Heretics don’t settle. Managers who are stuck, who compromise to keep things quiet, who battle the bureaucracy every day – they’re the ones who settle. Around about this time in the book I began to wonder – Do you have time to be a heretic? It felt like the book was pushing everyone in the direction of getting their word out. That could be internally within the organisation or wider on the internet. The internet approach would take time out of your busy personal life. If it is something you can spare and have the passion for it will be an easy choice. For those focussed on many things, juggling many activities including a family this will be harder. You might have to drop a hobby, but then again, your hobby should be an area of your key passion. Innovate quickly, fail quickly, adapt quickly. Faith is the unstated component in the work of a leader and is underrated. The book makes a point that religion = rules and faith = culture. Your tribe is your religion. Your faith is in your tribe’s values. I have heard Agile evangelists often called ‘The Agile Jihad”. It made me think about the training we provide and how from an outsider’s perspective it does look like an attempt to ‘convert’ others to our religion. For my two cents my religion isn’t necessarily Agile, it is a religion of embracing new ideas and change, of keeping people first. If you hear my idea but don’t believe it, that’s not your fault; its mine.